I told the boys that you could go up inside. They were so disappointed that we didn't have time to stop. I was a little disappointed too. It must be quite interesting from the inside. 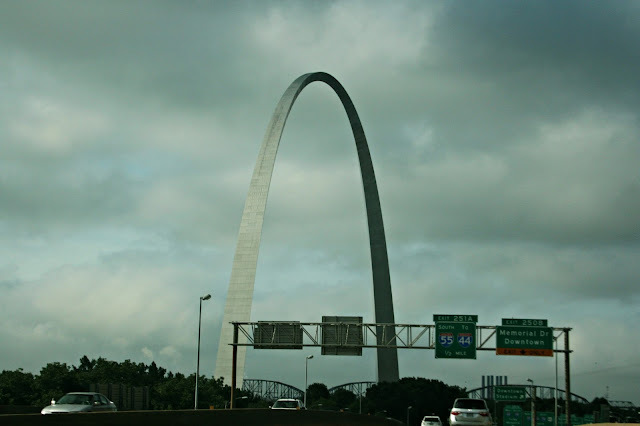 And then, just like that, we were past The Gateway Arch and headed further east. Kentucky beckoned. Goodbye St. Louis! Maybe next time we'll get a chance to explore. 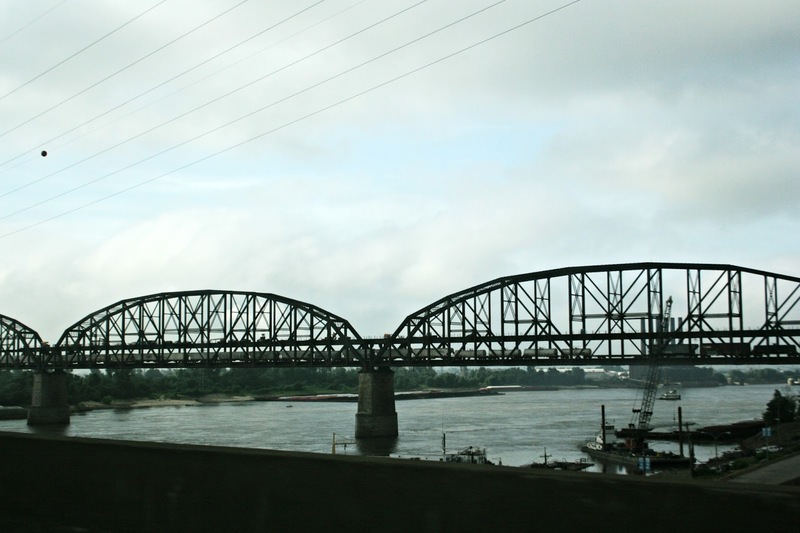 Readers, have you ever visited St. Louis? You guys had a good trip, the boys got to see so much. I have only been to the airport in St. Louis. I would love to go back and explore the town. I've never visited there. My sis just moved to KC last week. i've never been to the arch. I have a friend who lives very close to St. Louis; she loves her town. I've only been in the St. Louis airport, changing planes. I didn't know you could go up in the arch--that sounds cool! It would have been nice if you had the time to stop and go up in the Arch. I visited St. Louis and did go up in the Arch. I was terrified and could hardly enjoyed the experience. I've never been, though I hear it's a cool city. Our next family vacation sounds like it will be Kentucky/Tennessee. there's no way I would go up in the arch! Oh my goodness, so you can go all through the inside?And NO windows, I think I would feel buried alive, it is so thin. Once, when I was a little boy. My parents took us on a trip every summer and I remember visiting the zoo there. That is the biggest arch we ever did see. We drove by that arch.... we didn't get a chance to stop... Maybe next time. I've been past there a few times and I've never been inside either! I have not been, but I'd like to go. You got a great couple of pics! oh i've been up in there! i was actually pregnant with my twins at the time and it wasn't too long after 9/11 so it was a little nerve wracking to be in a monument. beautiful views from up there! 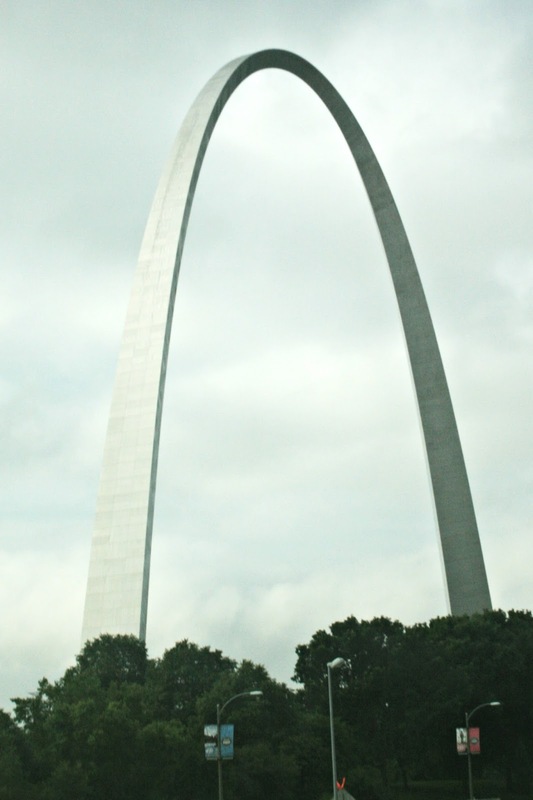 The Arch is truly a beautiful structure. Nooooo! Go back! You have to take the boys up in the Arch! You sit inside this little "capsule" to ride to the top. And then you are in a long hallway-like room with windows on both sides and you can see for miles. The arch actually sways a little bit if the wind is blowing hard, so it feels kinda strange up there. But it's marvelous! I've not been to St. Louis! I have to tell you that it was only few years ago that I learned you could actually go INSIDE the arch. I thought it was too skinny to enter it!